Marcus had his enemies, and the cast iron frying pan beside his corpse suggests that at last, his shady business deals went too far. Halia is desperate to keep Sweet Tea’s name out of the sordid spotlight but her efforts only make Wavonne a prime suspect. Now Halia will have to serve up the real villain–before the killer returns for a second helping. . . Features delicious recipes from Mahalia’s Sweet Tea, including Sour Cream Corn Bread and Sweet Corn Casserole! Haila and Wavonne are absolutely laugh out loud funny. Wavonne reminded me of Lula from Janet Evanovich’s Stephanie Plum series but she is even funnier. These two are in a fine mess when they find Marcus Rand, Haila’s silent partner, dead in Mahalia’s Sweet Tea. He is even more silent now. It looks like he has been hit upside the head with a cast iron frying pan. Haila panics when she thinks finding a dead body in her kitchen will mean the end of the Sweet Tea, so she decides to move the body. Wavonne is talked into helping her but she does something that soon will have her listed as the police’s prime suspect. Haila decides to find the real killer before her cousin ends up in the slammer and hilarity and drama ensues. I was grabbed by the title of this book and was completely drawn in to the story. The characters are full of humor, the mystery is great and the recipes and food sound delicious! Mahalia’s Sweet Tea sounds like a perfect place to visit for some fine fresh home-made food the will warm your soul. Haila has great business sense that she puts to good use and she tries figure out who relieved the world of Marcus’ misery. Turns out there are plenty of suspects. Wavonne is a gem who doesn’t have a lot of ambition but heart is in the right place. I can’t find out anything about this author but they are off to a fantastic start with this series. Set in a place near plenty of action I can’t wait to see what kind of mess Haila and Wavonne get into next. The title itself makes me want to read this. Sounds like a great story. I really want to read this book! Every review I’ve read has been great. Sounds interesting! Love the cover! Thanks for the chance! 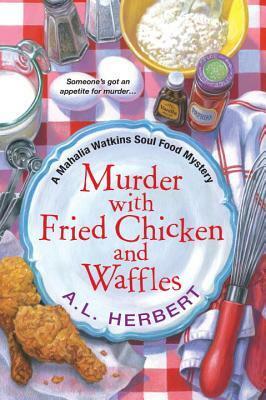 Murder with Fried Chicken and Waffles sounds like a delight to read. I have this book on my TBR list. Thank you for the review and giveaway. I love the title…looks like a fun book! Sounds like another fun series. Recipes. This is a very clever premise! I went to a famous restaurant in LA (Roscoe’s) that is popular for fried chicken and waffles. Will definitely buy this, no need to enter me in the drawing. Thanks for telling us about this interesting new series. I saw this book at the bookstore the other day and was surprised that I hadn’t heard anything about it. It sounds great and is on my TBR pile-hopefully winning here will take it off my virtual TBR pile and put it on my real one! What I love about cozies is that it gives you a little insight into life in other parts of the country. This sounds like another great read. Love the title and can’t wait to read it. Also love this site. I am sure it take a lot of time and I appreciate that. With this kind of food what not to like??????? ?I WANT TO READ!!!!!!!!!! Sounds like a great read. I love the book title. l love your review, if it can make me laugh then it’s a winner. The title alone should have told me that there is some humor going on. Sounds great, thanks for the chance to win. I love a book with humor in it. If they’re even half as funny as Lula it will be great! Chicken, waffles, and Lula-like character. What’s not to like? I love the cover. It looks good enough to eat right out of a southern kitchen. Thanks for the review/interview and the opportunity to win a copy of the book. This book sounds really good. I’m adding to my reading list. I love the title. mmm fried chicken..yum the book sounds good too. Sounds like a great story! “Foodie” cozies are my favorite! I love a book and characters that make me laugh and feel like old friends so I’m sure I’d love this book. And how could I resist that fun title and yummy cover! Oh, this sounds like an excellent new cozy series! I love food related cozies. Sounds like a fun cozy that will make me hungry with all that southern cooking! Thanks for the chance! Sounds interesting!